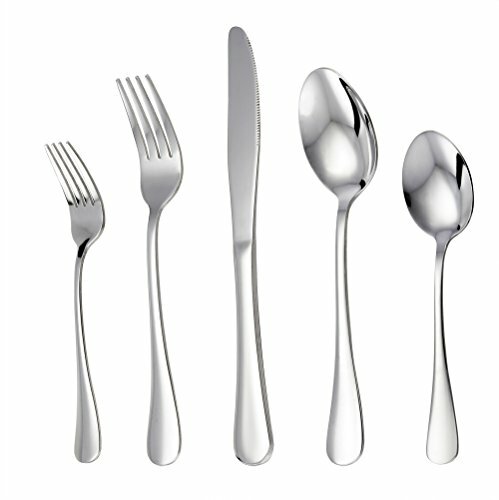 18/10 Stainless Steel The "grade" of stainless steel refers to its quality, durability and temperature resistance. The numbers (18/0, 18/10, etc.) are the composition of the stainless steel and refer to the amount of chromium and nickel (respectively) in the product. The chromium binds oxygen to the surface of the product to protect the iron from oxidation (rust). Nickel also enhances the corrosion resistance of stainless steel. Therefore, the higher the nickel content, the more resistant the stainless steel is to corrosion. 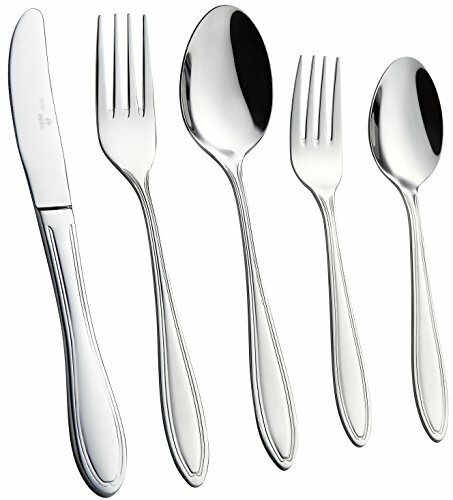 Sleek design The high thickness and the beautiful sleek surface give a very good feeling when holding the flatware in hand. This design is available in Mirror Finish, Entirely 24K Gold and Rose Gold colors. 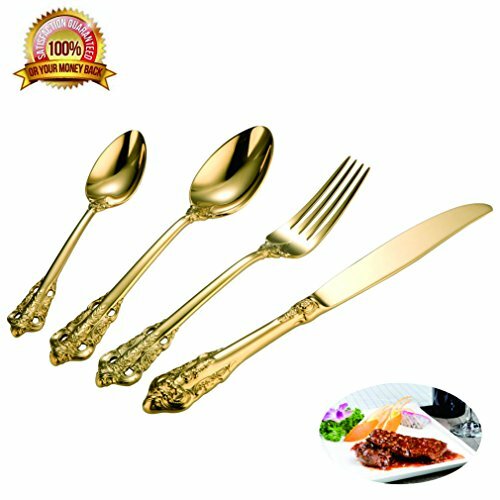 Combinations and Heights 4 x Dinner fork 8-inch 4 x Dinner knife 9-inch 4 x Soup spoon 8-inch 4 x Salad fork 6-inch 4 x Teaspoon 5.5-inch Thickness The thickness of the knife’s handle is 9 mm and the thickness of forks and spoons are between 3.5 mm and 2.5 mm. 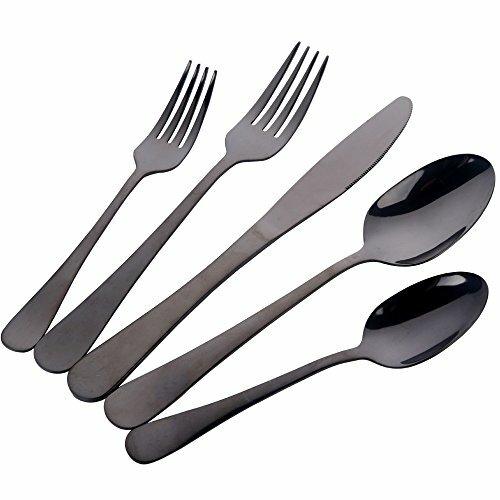 Easy Clean Smooth edge no rough spots, Cleaning up is a breeze, even hand wash or in the dishwasher Variety 20-piece full set for 4, 2 different sizes of spoons, 2 sizes of forks and 1 size of the knife, Perfect for everyday use, camping, travel, etc. 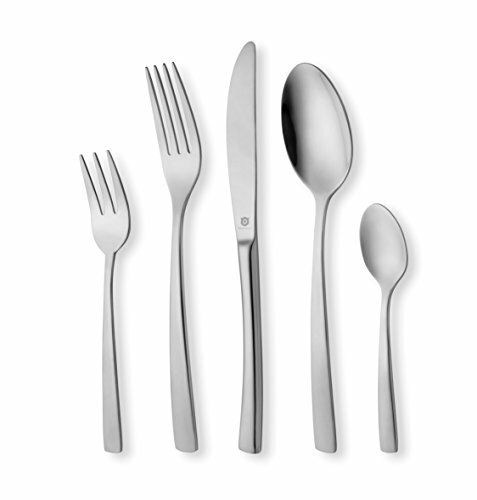 18/10 Stainless Steel The "grade" of stainless steel refers to its quality, durability and temperature resistance. The numbers (18/0, 18/10, etc.) 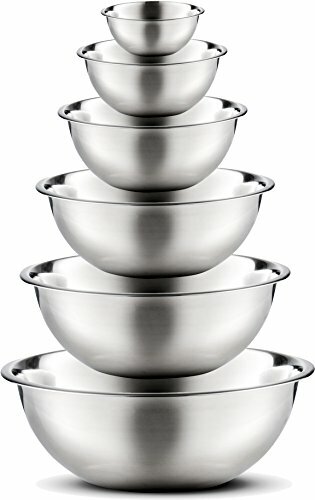 are the composition of the stainless steel and refer to the amount of chromium and nickel (respectively) in the product. The chromium binds oxygen to the surface of the product to protect the iron from oxidation (rust). Nickel also enhances the corrosion resistance of stainless steel. Therefore, the higher the nickel content, the more resistant the stainless steel is to corrosion. 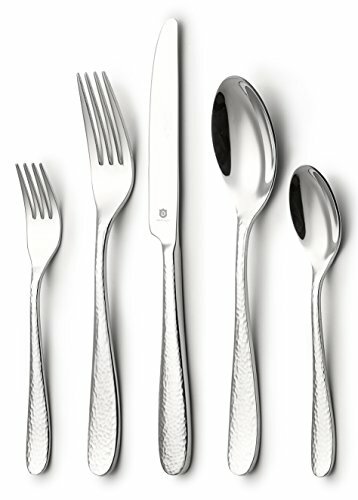 Hammered Design The high thickness and the beautiful hammered surface give a very good feeling when holding the flatware in hand. This design is available in Mirror Finish, Entirely 24K Gold and Rose Gold colors. 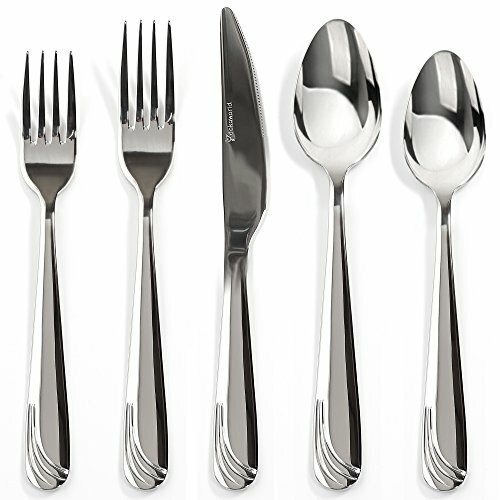 Combinations and Heights 4 x Dinner fork 8-inch 4 x Dinner knife 9-inch 4 x Soup spoon 8-inch 4 x Salad fork 6.3-inch 4 x Teaspoon 7-inch Thickness The thickness of the knife’s handle is 8 mm and the thickness of forks and spoons are between 4.5 mm and 3.5 mm. 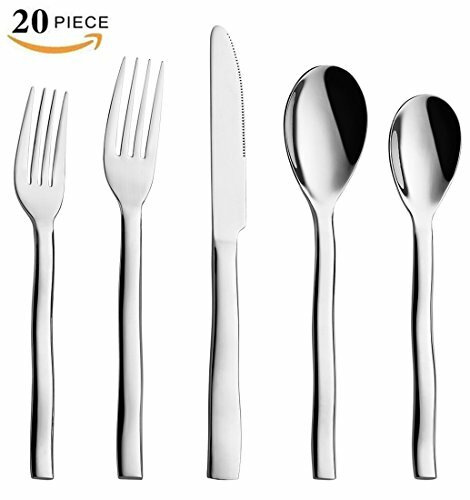 Easy Clean Smooth edge no rough spots, Cleaning up is a breeze, even hand wash or in the dishwasher Variety 20-piece full set for 4, 2 different sizes of spoons, 2 sizes of forks and 1 size of the knife, Perfect for everyday use, camping, travel, etc. Sanding & Polishing Stainless Steel To A Mirror Finish Made Easy! DIY: How to 5$ polish and get a mirror finish - TL Productions. 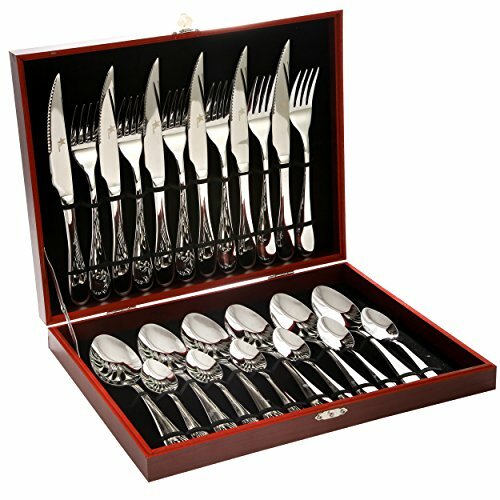 Compare prices on Mirror Polished Set at TopShopion.com – use promo codes and coupons for best offers and deals. We work hard to get you amazing deals and collect all avail hot offers online and represent it in one place for the customers. Now our visitors can leverage benefits of big brands and heavy discounts available for that day and for famous brands.